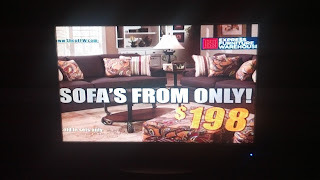 Cathy writes that she was watching TV while her husband was still asleep and this catastrophic commercial came on Fox 5. She ran the risk of waking her husband up, but it was worth it to capture the apostrophe catastrophe in all its glory. The exclamation point is in an odd place, too.